The Signe family is blessed with two daughters. Consuelo, the elder, is thought of as pensive and book-loving, the serious child-la niña seria-while Mili, her younger sister, is seen as vivacious, a ray of tropical sunshine. Two daughters: one dark, one light; one to offer comfort and consolation, the other to charm and delight. But, for all the joy both girls should bring, something is not right in this Puerto Rican family; a tragedia is developing, like a tumor, at its core. In this fierce, funny, and sometimes startling novel, we follow a young woman’s quest to negotiate her own terms of survival within the confines of her culture and her family. "Judith Ortiz Cofer opens for us a window of understanding into the riches of Puerto Rican culture. Her brave, gritty narrator, Consuelo . . . is the perfect tour guide through this compelling, deeply honest novel about the pain of family secrets." "A bittersweet tale of the price one pays to reinvent the story handed down by one's antepasados and familia. Consuelo is both herself and every mujer, and her story her own and that of her island, torn between self-discovery and safety." "Funny and affecting, this rite of passage novel celebrates familia y cultura, and artful ways to escape them unscathed. 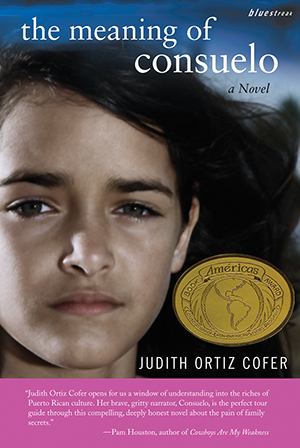 Judith Ortiz Cofer is one of our most gifted authors." "Judith Ortiz Cofer has created a character who takes us by the hand on a journey of self-discovery. She reminds readers young and old never to forget our own responsibilities, and to enjoy life with all its joys and sorrows."